Microsoft Hotmail has just introduced its new Social Media feature in Hotmail. 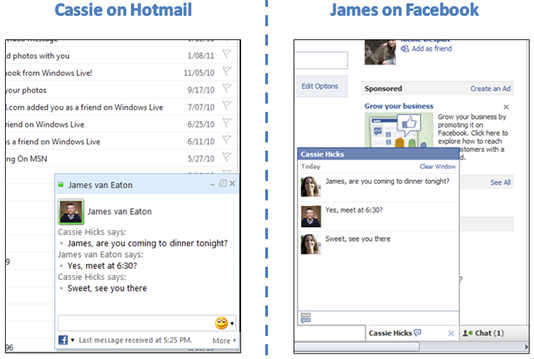 Now hotmail users can chat with their facebook friends instantly within hotmail. Just a few days after announcing social media functionality in the newest version of the Bing toolbar, Microsoft announced that the ability to access Facebook chat within Hotmail is now available in every part of the world that the social network reaches. When we first announced the ability to chat with Facebook friends from Hotmail, we were only able to offer this to customers in six regions. Since then, we’ve been working with Facebook to increase availability, and a few weeks ago, we announced that the feature was available globally through Messenger. Today this is available around the world through Hotmail too. And while Gmail beat us to bringing their own chat into the inbox, we have now gone a step further and brought both our own chat and Facebook chat into your inbox. Starting now, we will be displaying notifications of this update in Hotmail. Since announcing the availability of Facebook chat in Messenger worldwide two weeks ago, nearly 2.5 more million people connected their Facebook accounts to Windows Live, bringing the total to over 20 million customers. And with three out of four Hotmail customers using Facebook, we expect that many more people will want to take advantage of this feature, now that it’s available from your Hotmail inbox. What do you think about this new chat feature? Do you use Hotmail Chat while checking out your E-mails? ?